In the game of the day Sunday, Rajon Rondo led his Boston Celtics to a thrilling 115-111 overtime victory over the New York Knicks. Although Paul Pierce tied a season high with 34 points and hit a game-tying three to send the game into OT, it was Rondo who was the driving force to victory. From the opening tip Rondo attacked Knicks point guard Jeremy Lin on the offensive end while pressuring Lin defensively. Even though Rondo only shot 7-20 from the field he was still able to control the game, recording a historic triple-double. Rondo’s 18 point, 20 assist, and career high 17 rebound performance puts him in a category with only him, Magic Johnson, and Wilt Chamaberlain. Magic Johnson (24 points, 17 assists, 17 rebounds) was the last player to record a triple-double with at least 17 in each category. Wilt is the only player to ever record 20 on each category(22 points, 25 rebounds, 21 assists). Yes, Rondo is a hothead, yes he is sometimes hard to coach, and yes he cannot shoot the ball, but he is one of the best pure point guards in the game. 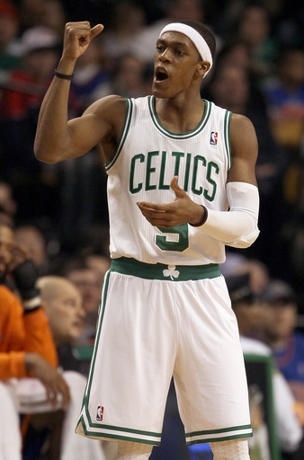 Performances like yesterday’s are why the Celtics should and will not trade Rajon Rondo. This is the true leader of the Celtics. They should not talk about trading him ever again.